Karen Marshalsay's music draws on a wealth of differing experiences, from work within the Gaelic and Scottish traditions to studies with Paraguayan harp master Rito Pederson. 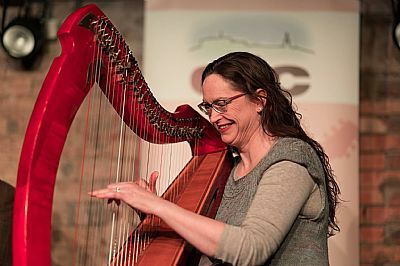 Playing both gut and wire-strung clarsachs (Scottish harp) as well as bray and Paraguayan harps, Karen has developed through the folk world of feisean, festivals and lessons with leading players such as Alison Kinnaird and Bill Taylor. Karen's credits have included appearances at the Edinburgh International Festival, the Edinburgh International Harp Festival, commissioned pieces for Celtic Connections and others, and work as musical director of ALP's Scots Music Group Big Band. She has taught and performed at festivals in the USA, Australia, France, Germany and Switzerland, as well as numerous home festivals and events. Karen is an experienced harp teacher, has taught at many feisean and festivals, was the clarsach tutor for 7 years at Sgoil Chiùil na Gàidhealtachd (The National Centre of Excellence in Traditional Music) at Plockton, and previously lectured in Scottish and World music and taught wire-strung clarsach and bray harp at the RSAMD (now the Royal Conservatoire of Scotland). Karen is the general editor and owner of Marsharp Music and has published six of her own books - a three volume series of graded arrangements for gut-strung levered clarsachs (The Clarsach Collection), an introduction to playing wire-strung clarsach (First Steps) and a book of techniques suitable for all harps (Key Techniques for Harp). Her latest book, Guid Scots Sangs, of Scots songs arranged for wire-strung harp was published in April 2014.